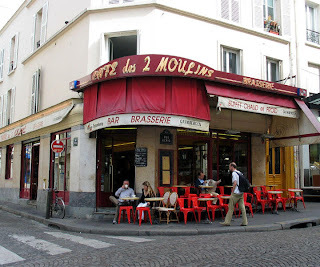 "Le Fabuleux Destin d’Amélie Poulain"
The movie "The fabulous destiny of Amélie Poulain" takes place in its majority at the neighborhood of Montmartre, in Paris, where we can find some of the places which the wonderful movie photography transforms into pure magic. 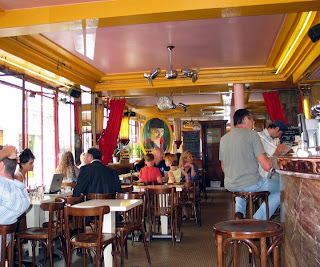 The first mandatory stop is in the "Cafe des Deux Moulains" that is on Lepic, 15, right on the corner. This place has almost the exact environment that is shown in the movie, even though the tobacco shop which Georgette felt suffocated is not there. 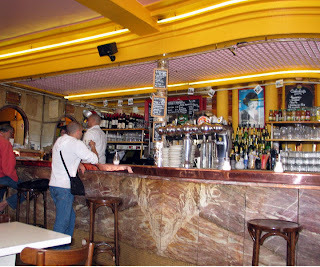 It is possible to observe the predominance of the colors yellow and red, to enter in the restroom and imagine the place where Georgette and Joseph made love, besides appreciating two posters of the movie and some photos in Polaroid with the gnome’s trips, held behind the coffee counter. Tourists are welcome in the place and there are no problems in taking pictures. Moreover, the food is excellent and they make a wonderful "crème brulée" for you to appreciate; one of Amélie’s small pleasures that was to break the hard topping of melted sugar from the sweet, very cutely dessert. 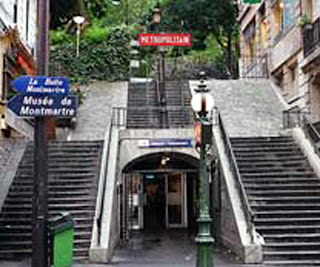 Going through Lepic street, turning the first street on the right, go straight on rue des Abesses (Abesses's street) and rue de la Vieuville (Vieuville’s street) till the Abesse subway station from the Paris subway, that appears sometimes in the film and has one of the remaining Art Nouveau metro entrances. 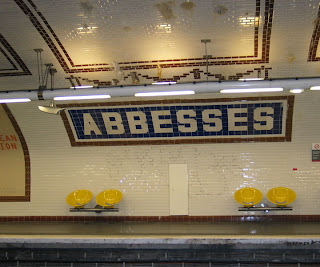 The subway station has a lot of staircases, full with decorated walls and paintings from the district of Montmartre, what makes it a pretty pleasant journey. That was the place where Amélie meets the blind man. 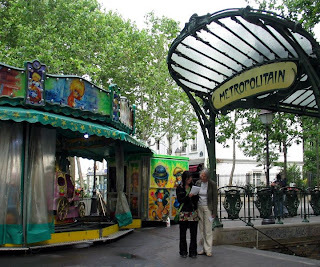 You can imagine his transcendence experience as Amélie describes the mouthwatering sights of the bustling market on rue Lamarck until you reach the beautiful metro station Lamarck-Caulaincourt with the double staircase. marck. 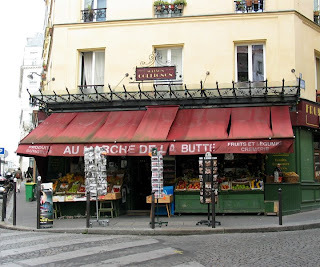 Next, by the street of Trois Fréres and rue Gabrielle, we reach the grocery’s store named "Au Marche de la butte" and Collignon’s house. Although there is no grain bag at the door that we can sink our hands in and appreciate their textures, which was another pleasure from Amélie, you may buy some post cards and posters from the movie that are sold there in the grocery shop. Keep climbing the up hills of Montmartre until you arrive at the "Sacre Coeur" Catedral and at the corner of Saint Michel, from where we can enter into the park scenario from the love meetings between Amélie and Nino, where she raised an amazing atmosphere of mystery and drew seven blue arrows on the floor. 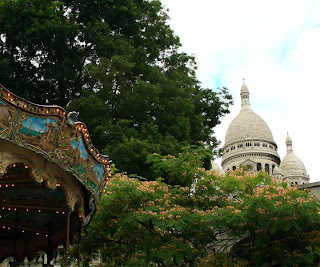 Unfortunately, there is no sign of the phone booth, but the place holds a very beautiful view from Paris and a carrousel that is full of charm: that is, a perfect place to feel the atmosphere of the movie. 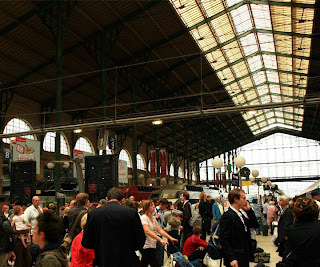 It is also possible to take a look at Gare du Nord, one of the train stations that appears in the film and where Amélie goes to her father’s house and also at Gare de l’Est railway station where Nino loses his collection book of automatic photos and where Amélie and Nino finally discover the secret of the photo-machine. It is even possible to appreciate the Channel of Saint Martin, where Amélie throws rocks into the water and you can have an idea of how genius the photography of the movie is! 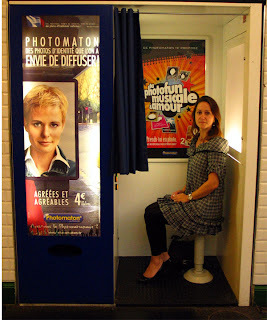 Do not forget, finally, to visit one of the booths of automatic photos that are the essence of the film! Au revoir! sweet! it is now gonna be one of my dreams to do the walk for real... thanks for being so detailed. one day, i will make my dream come true. so jealous that you get to absorbed here! so inspiring and nothing but beauty for the eye.. amazing!! i must go there someday! this is one of my FAVORITE movies of all time. what a great idea you girls had to use amelie as inspiration for scrapbooking! Why did you decide to take this trip? 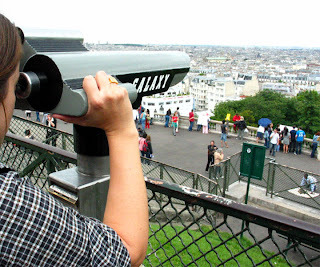 What did you do during this trip to Paris (by this I mean, visits and actions related to the movie)? 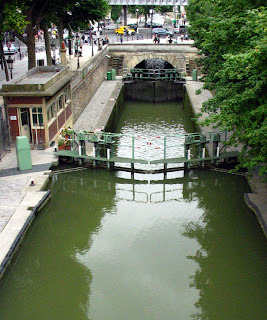 What does it feel like to visit Paris and the filmlocations of Amelie Poulain? What made this trip interesting for you? In what way does this trip changed your attitude (towards Amelie)? What is different now that you have been here? What was the goal of this trip? I really hope one of you, or perhaps all of you would be so kind to answer this questions for me. Of course all readers of your blog are also welcome to answer these questions! I am a total Amelie fan, and am doing this trip in October. I would like to answer the questions when I've done the trip. To wienekevdk@gmail.com. such beautiful photos i like them all . Does this wonderful girl inspire you? Well she does inspire us! And we hope you will join us on this journey to discover all of the details from this great movie and wonderful girl. 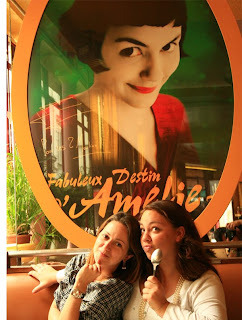 We started this challenge blog to give you ideas and challenges inspired by the movie Amelie. Sometimes this can be a quote other times a color combination etc. You have to see for yourself in the upcoming challenges announced on the 10th of each month. Are YOU inspired by Amelie? Help us spread the word by displaying a blinkie at your blog!